Even with optical and image stabilization capabilities built into compact digital point & shoot cameras and many SLR lenses these days, there are times when it just isn’t enough. Can you hand-hold a P&S camera – or any camera for that matter, stead for 5 seconds as you try to photograph fireworks? I don’t think so. When travelling, I sometimes take my full-size tripod (shown here), other times I pack my compact one. When those options are too unwieldy, I bring along a GorillaPod. I have an older “GorillaPod SLR” model that I bought a while ago, but newer models include ball heads, heavier duty joints, and bubble levels. GorillaPods are fairly inexpensive, ranging from $16 for the P&S model, to $30 and up for more sophisticaned and larger capacity ones. There are plenty of knock-offs on the market these days, but I haven’t yet seen one that compares to Joby’s quality. 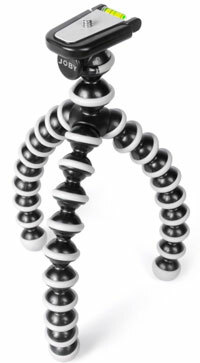 I’ve used my GorillaPod in the sand, on tables, off railings, in the snow and in a grassy field. I never found a good time to wrap it around a tree as shown in various advertisements, but one day I’ll find a good reason to do so. « Finally Ordered a Timbuk2 Messenger Bag! Oh man, just pair it with a remote shutter control on the SLR and I would have a great setup to use when my wife and I go hiking instead of using the timer and then running to get the back in the frame. That sounds good! I usually use a similar “set timer, dash into frame” method as well. One of these days I might be compelled to buy an IR remote to complement the wired one I use often.